Comments: The obverse was struck using the F.C. 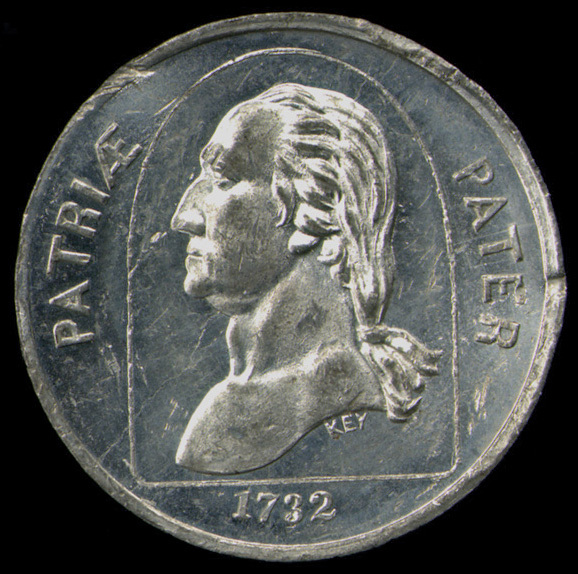 Key die depicting an undraped bust left of Washington within an arched frame. The Latin on the obverse, which is the opposite of the usual word order, translates as Father of the Country, while the date 1732, in exergue, is the year Washington was born. Note there is a die crack that travels from the bottom rim at about 7:00 o'clock up through Washington's throat, jawbone and hair to the rim at about 1:00 o'clock. 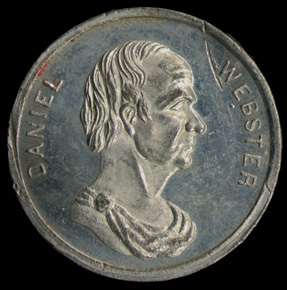 The reverse shows a bust right portrait of Webster draped in a roman mantle. The Webster die was also used for an 1860 storecard for Joseph N.T. Levick (Miller NY 433-435) and like all the reverses listed below, it was also muled with the Mobile Jockey Club obverse (Miller Ala 17-21) as well as in combinations with other of these related dies. These combinations were created by George H. Lovett at the order of Joseph N.T. Levick as discussed above. The F.C. Key arched bust of Washington was also used on an 1860 dated storecard for the New York City coin dealer E. Hill (Miller NY 305-308); Hill also issued an 1860 storecard with the Webster die (Miller NY 309-312). Several medals show Washington on one side and another well know figure on the other. These individuals included Washington's wife Martha (Baker 208-209) as well as famous contemporaries such as Lafayette (Baker 196-200) and Franklin (Baker 201-207) and other individuals as Webster, Henry Clay (Baker 212-213), Edward Everett (Baker 214-215) and even the actor Edwin Forrest (Baker 220). In 1864 a reverse with General McClellan was issued (Baker 216-219). Washington was also pair with several other presidents on medals including Jefferson (Baker 222), Jackson (Baker 223-226), Harrison (Baker 227-229), several with Lincoln (Baker 230-248), Grant (Baker 249-256A) and Hayes (256X) This reverse shows Daniel Webster who was a prominent U.S. senator from Massachusetts and Secretary of State (under Harrison, Tyler and later under Fillmore). Along with Henry Clay, Webster was a leader of the Whig party. Webster died in 1852. Provenance: Part of an anonymous donation consisting of 1100 tokens and medals covering the Nineteenth century, primarily up through the Civil War era. Reference: Rulau and Fuld, p. 89; Baker, p. 98; Rulau, Standard Catalog of United States Tokens, 2nd ed., pp. 179, 241 and 245. Comments: The obverse was struck using the F.C. Key die depicting an undraped bust left of Washington within an arched frame. Note there is a die crack that travels from the bottom rim at about 7:00 o'clock up through Washington's throat, jawbone and hair to the rim at about 1:00 o'clock. The reverse uses the obverse die from the 1853 token made for the Mobile, Alabama Jockey Club (Miller Ala 2-6) depicting a horse facing left with a die crack from the bottom of the horse's truck near the back legs. Fuld lists this muling as a rarity of 8 with a population of between five and nine examples. It was issued in both copper and white metal. This example has some dents on the edge and several small scratches on the surfaces. 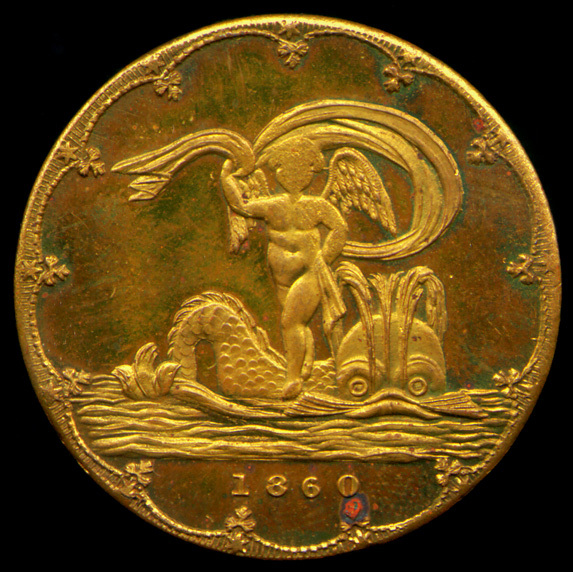 The Jockey Club obverse was muled with several dies including: the 1860 dated cupid on a dolphin, the witch on a broomstick, the Daniel Webster reverse, with it's original reverse (the Non-Transferable 1853) and possibly with other dies. These combinations were created by George H. Lovett at the order of Joseph N.T. Levick as discussed above. 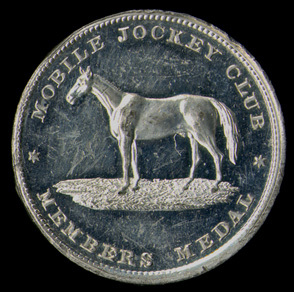 The original 1853 Jockey medal can be distinguished from the later muling of its obverse and reverse in that the later muling does not include the name on the obverse. See the listings as Miller Ala 7- 26C in Rulau. Reference: Rulau and Fuld, p. 149; Rulau, Standard Catalog of United States Tokens, 2nd ed., p. 179. Comments: The obverse was struck using the F.C. 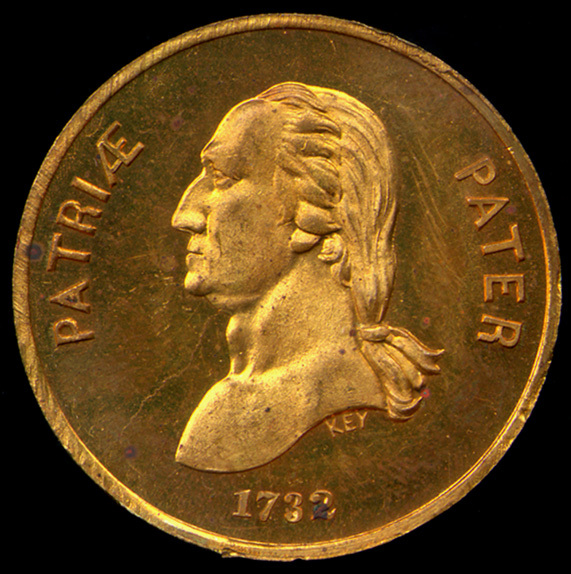 Key die depicting an undraped bust left of Washington. Note the die crack that travels from the bottom of Washington's ear to the rim. The reverse depicts the winged Cupid riding a dolphin which is spouting water, the entire scene is framed with an ornamental border design. 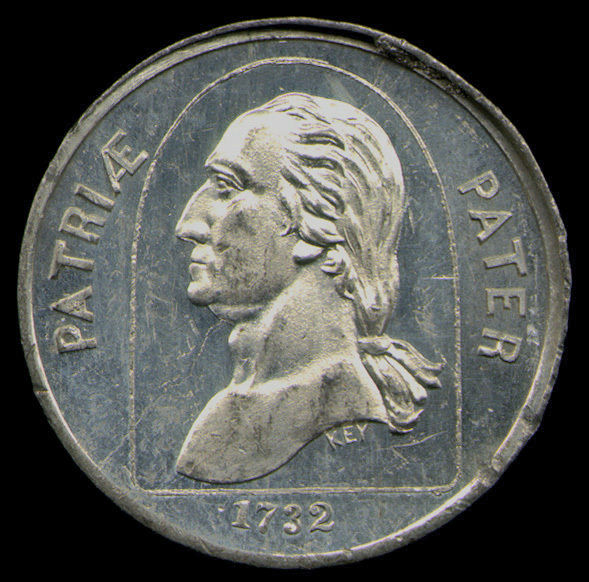 The token was produced in silver, copper, bronze, brass and white metal, each variety is listed as having a rarity of 7 with a population of between ten and nineteen examples. This is one of only two dated example in the Lovett series of mules using Key's die as is the basis for dating the series to ca. 1860. An undated Cupid on a dolphin was used for George H. Lovett's storecard thought to be from 1858 (Miller NY 486-488A) while an 1860 dated version was used on a Joseph N.T. Levick storecard (Miller NY 439-441). 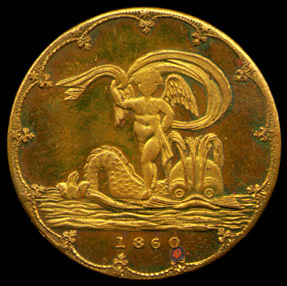 The use of the dated Levick storecard dolphin die in the muled Washington series most probably dates to after its use on the Levick storecard in 1860. Thus the mules could date to 1860 or possible sometime soon after. References: Rulau and Fuld, p. 259; Rulau, Standard Catalog of United States Tokens, 2nd ed., pp. 245-246 for the Levick and Lovett dolphon tokens.